St. Joseph offers a rich history. The Gateway Chapter protects and promotes the St. Joe Road in the City and the Northeast Kansas counties of Doniphan, Brown and Nemaha including branches from river crossings at Amazonia and Iowa Point. Fascinating historical landmarks and historic sites include Doniphan County’s Courter-Ritchey Cemetery that contains graves from the 1849 Cholera epidemic. Also included was The Iowa Sac-Fox Presbyterian Mission and on the Missouri side the Banks Ferry connected at Iowa Point. A swale in the Wolf River Valley is still seen today. The Sac tribe built a log crossing on the Wolf River and collected a toll. Another interesting place to visit is the Bank’s Ferry House, the remains of which can still be seen. At the western end of the St. Joseph Road, Francis Marshall set up the ferry service on the Big Blue River in 1852. The mass migration of 500,000 emigrants looked for the most efficient routes where they could gain adequate supplies for the long journey. St. Joseph entered the competition with a number of editorials in the weekly St. Joseph Gazette in February and March of 1849. An editorial entitled “Important to California Emigrants” compared Independence and St. Joseph and offered endorsements for St. Joseph from such western travelers as Col. William Gilpin, Cmdr. Robert F. Stockton, Maj. Archibald Gillespie, Gen. Stephen Watts Kearny, Representative Willard P. Hall, Capt. Miles Goodyear, Maj. Joseph L. Meek, and Maj. Moses Harris (also known as “Black Harris”), all of whom had traveled the route in 1847–1848. The newspaper assumed that the Mormons would outfit in St. Joseph, a logical conclusion considering the fact that only a few years before they had been driven from Independence; but the majority of Mormons left from Kanesville. Editorials in the next two issues of the Gazette further attempted to establish St. Joseph as the ideal jumping-off place. Selecting “The Best Starting Place” was the immediate and most important decision that California and Oregon-bound emigrants must make. There were three principal things to consider in the choice: “First, the ease and facility of access to the places, from the different portions of our common country in the west, which will make up the great tide of emigration across the Rocky Mountains—second, the means of procuring a complete outfit—and thirdly, the comparative distance from the different points proposed . . . to the junction of the common route.” Claimants for the designation of the best starting point were Weston, Independence, and St. Joseph. The Gazette asserted that St. Joseph offered a distinct advantage in comparative distance to Grand Island, where all roads converged. Travelers from Weston had to travel thirty miles before connecting with the St. Joseph road, thus making the trip from St. Joseph thirty miles shorter than the trip from Weston. Independence had its own route, but it was “crooked and circuitous having the Kansas River, and many other large streams,” which made it longer by some ninety miles, or six days travel. Anyone weighing all the facts could easily see the “fallacy” of Mr. Gilpin’s reasoning in advocating Independence as a starting point. The Independence Expositor in 1847 had denounced the St. Joseph road as “almost impassible” for wagons, while the Independence route was level and beautiful. A third Gazette editorial recognized the growing significance of the competition: While Lexington and Independence are urging themselves into notice, as the most advantageous points at which companies en-route for the gold regions, or other parts of California should assemble, it is deemed but justice to the emigrants—as much depends upon a prosperous beginning—that he should know that St. Joseph possesses advantages unequaled by any other point upon the Eastern border of our state. Writing from St. Joseph on April 2, 1849 “California” discovered that the “immense emigration” to California gave impetus to Independence, Westport, Weston, and St. Joseph. Every lodging was full, and people were camping out. Some emigrants had arrived by boat, others overland; some were fully outfitted, others not at all. Prices, quantity, and quality of mules, oxen, and other goods were comparable among the four places. St. Joseph Gazette (hereinafter Gazette), February 16, 1849: the town could also offer more in the way of supplies to the emigrants. There were nineteen dry goods stores, two or three of which offered everything an emigrant could want. In addition there was a large amount of bacon, two flour mills, three drug stores, “Saddlers, Shoemakers, Wagon makers, Tinners, Blacksmiths, Cord-wainers, Carpenters, Tailors, Gunsmiths and all other mechanics, who for industry, skill and promptitude and business, cannot be surpassed.” There were two ferries, three large hotels, and bounties of agricultural products from the surrounding country. 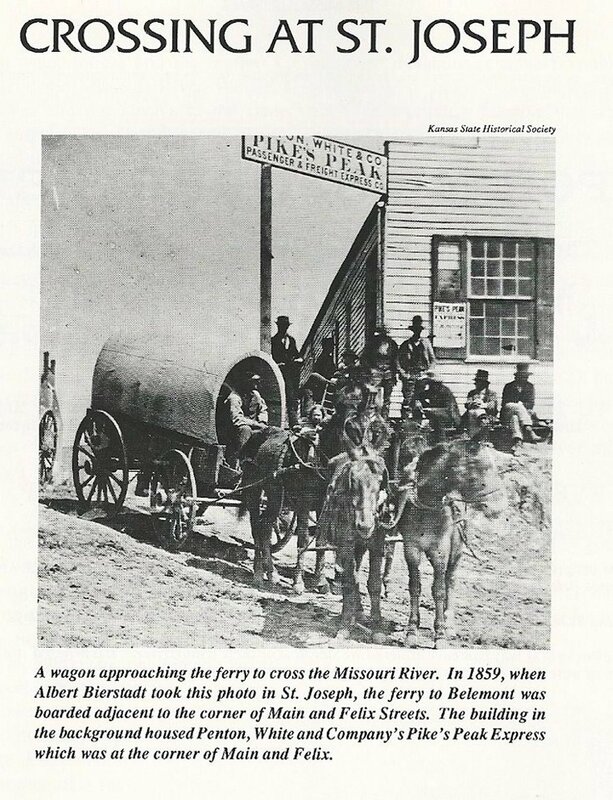 Discover more about the experience of the emigrants traveling through St. Joseph on pages 84-92 of the Overland Journal article from the link below. 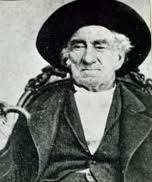 Joseph Robidoux was a successful French fur trader who established a trading post in 1826 (near what is known today as Riverfront Park in St. Joseph), while it was still Indian Territory. Robidoux and his family oversaw a far-ranging fur trading empire. The Platte Purchase of 1837 added the six county northwest corner to the state of Missouri. 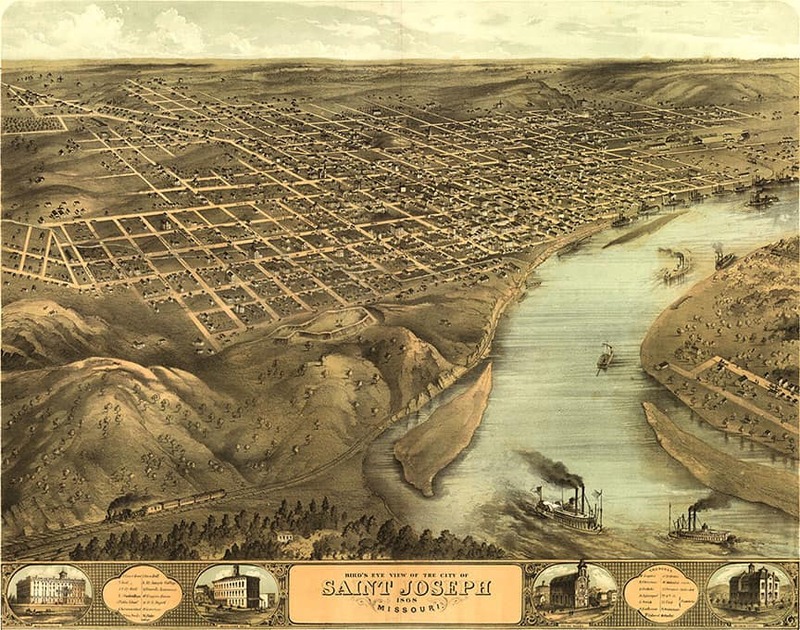 With the opening of the area to settlers, Robidoux incorporated the town of St. Joseph in 1843, naming it for his patron saint. Learn more at the link below and at the Robidoux Row Museum. On April 3, 1860, a lone rider left on horseback from the gates of one of the nation’s most historic landmarks, the Pikes Peak Stables in St. Joseph, Missouri. Carrying saddlebags filled with our nation’s hopes and dreams, the Pony Express riders traveled 2,000 miles west to Sacramento, California. These brave young souls raced against nature’s cruel elements and rugged terrain in an attempt to unite a country separated by distance. Today the stables continue to stand as a tribute to the legend and legacy of the Pony Express and its enduring era. 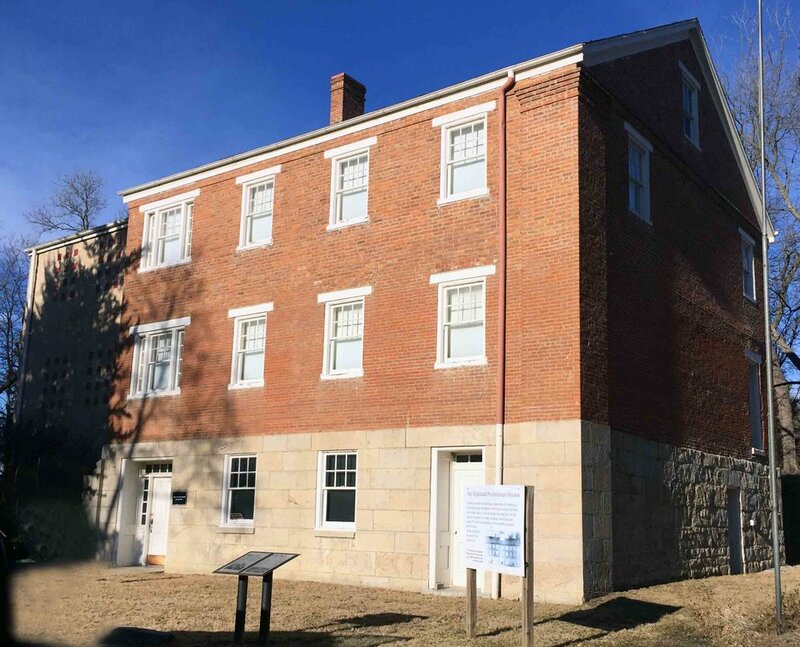 The Mission was established in 1837 and the building was open in 1845 to serve three Eastern tribes that were relocated to Kansas reservations, but has since been closed. A 30-yard swale of the nearby overland trail is still visible east of the mission building. In 1849 cholera spread into the Indian community near the mission, and a smallpox epidemic took more lives the following year. The mission is now owned by the Kansas State Historical Society. The luxury hotel was built in 1858 by John Patee. Patee House is a National Historical Landmark for having served as St. Joseph headquarters for the Pony Express in 1860. It was here that Pony Express operators Russell, Majors and Waddell had their St. Joseph office, and it was at Patee House where Pony Express riders stayed. During the Civil War, the Union Army took over the hotel, and Patee, who was backing the Confederacy, decided to sell the building in a nation-wide lottery. When 100 tickets came back unsold on April 28, 1865, Patee bought them himself and won back his own hotel. Belemont Landing on the Missouri River.